The Dynasty 280 Series has now expanded beyond the industry leading TIG and Stick performance by the additional CV output which allows for MIG capability - making this multiprocess line the perfect solution for ship building, construction, mechanical contractors, educational and more. CV output of the power source gives this unit MIG process capabilities when paired with an ArcReach® 8 or 12 (or other voltage-sensing feeder). Allows for any input voltage hookup (208–575 V) with no manual linking, providing convenience in any job setting. Ideal solution for dirty or unreliable power. High-frequency (HF) arc starter for non-contact arc initiation. Provides more consistent arc starts and greater reliability compared to traditional HF arc starters. Cooling system operates only when needed, reducing noise, energy use and the amount of contaminants pulled through machine. feature operates the auxiliary cooling system only when needed, reducing noise, energy use, and airborne contaminants pulled through the cooler. Eliminates the guesswork when setting weld parameters. Use Pro-Set when you want the speed, convenience and confidence of preset controls. Simply select the feature and adjust until Pro-Set appears on the display. Formerly known as the WP-17 Series, the A-150 Series is comprised of an assortment of versatile and innovative air-cooled torches designed for maximum operator comfort. Formerly known as the WP-26 Series, the A-200 Series provides dependable, top performing torches designed for heavy-duty welding applications. Formerly known as the WP-20 Series, the W-250 Series provides consistent torch performance designed for long-term, trouble-free service around-the-head water-cooling. The W-375 Super Cool™ is a reliable water-cooled torch designed for demanding, high amperage applications. The W-375 Super Cool is engineered with innovative technology and welding efficiency in mind. Welding helped Michael Brandt turn his life around. Now the Garage Bound, LLC, owner helps build welding skills in his community. The Dynasty® 280 DX Multiprocess welder provides portability and ultimate versatility to weld many different materials. Follow these step-by-step instructions to set up your Dynasty 280 DX Multiprocess using an ArcReach SuitCase 12 feeder. 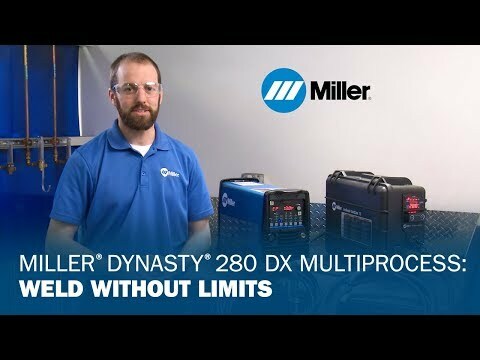 Learn how to set up your Miller Dynasty 280 DX Multiprocess to get the best results when welding steel. When welding aluminum, follow these tips to set up your Dynasty 280 DX Multiprocess using an ArcReach SuitCase 12 feeder. Learn how to set up your Miller Dynasty 280 DX Multiprocess to weld steel using self-shielded flux-cored wire.